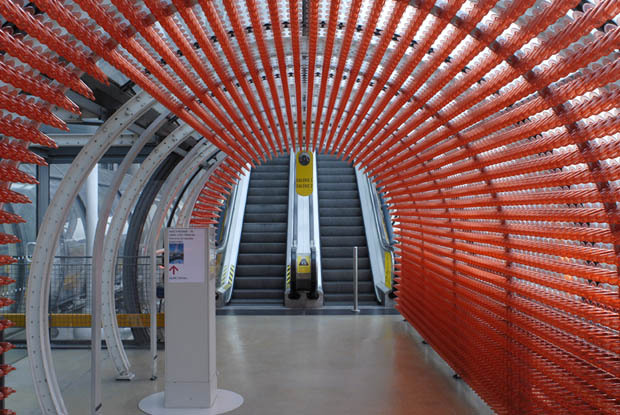 Continuing with the escalator theme, here’s an installation by Irish artist Bryan McCormack that was at the Centre Pompidou in Paris a couple of months back. 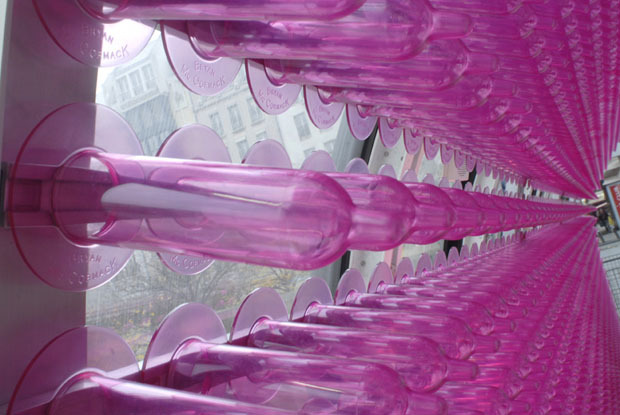 Preservation of Life: Les sons de la vie—as the sound and light installation was called—started at the museum’s façade and continued up its famous 6-floor escalator as part of the art center’s AIDS annual fundraising campaign. 80,000 condom covered light bulbs in different colors, with hues changing on every floor, were used to form a condom tapestry. Accompanying the dramatic tunnel visuals was audio of a human heartbeat, with the pulse changing along with the colors, starting at the base with the cardiac rhythm of a fetus in the womb and progressing at every level, to a newborn baby’s heartbeat and, finally, to the artist’s own heartbeat on the top floor. Though I didn’t see it written anywhere, I’m pretty sure that the title is a pun. In French, and in Spanish, preservatif, and preservativo, mean condom. You can buy one of the condom bulbs here. This entry was posted in Art, Event, Fun, Just Plain Cool, Light, Pop Culture. Bookmark the permalink.